The combination of cannabis and training may be a strange concept due to former stoner stereotypes but this combination of cannabis and physical training is on the rise. This is especially true for the long distance runner, where the use of cannabis is gradually developing into an underground culture. Runner long distances after having used marijuana has become a hit among the more open minded runners. Marijuana is a known anti inflammatory and pain reliever, which is a welcome sentiment on long runs. Runners have also found that being under the influence of sativa dominant weed assists in focus and actually prevents boredom (which is a real issue for long distance runners). The high THC content keeps the mind focused and alert and prevents ‘false’ fatigue that would normally be caused by the mind losing focus and becoming bored. If you are not a long distance runner than this may sound like a completely foreign concept to however, take it from experience, it is a legitimate claim. Chris Barnicle is a retired professional athlete and has dubbed himself the ‘world’s fastest stoner’. Chris is a weed advocate uses twitter to spread his title as the world’s fastest stoner. There are currently a couple running groups that focus on running and cannabis education. Such groups are Run on Grass from Denver and the online groups are NORML Athletics and Cannafit. 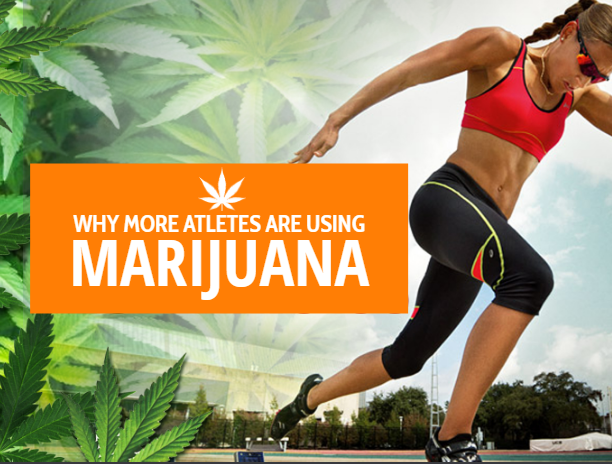 While Runners are certainly in the spotlight for training while under the influence of weed , there are other athletes in various other sports that are finding the use of weed beneficial in their training programs. Athletes such as mountain bikers, snowboarders and skiers finding marijuana a good kickstart to getting into the right mainframe for their sport. Bodybuilders are also employing the use of marijuana, mainly for the plants anti-inflammatory properties and pain relieving. In addition to that, anyone who has trained hard would know that sometimes training hard can make it difficult to fall asleep, despite many people thinking they would just collapse on their beds. A long distance runner can relate to the feeling of constantly thinking about how many mies are still ahead and how much longer still to go. it is natural for the mind to become bored during a long distance run and the right strain of cannabis, with the appropriate blend of cannabinoids, can keep you mind on track, so to speak. Cannabis and the body’s reaction to cannabinoids helps to keep the mind saturated in the moment so that it does not become bored and start to focus on fatigue or pain that may be feeling. apart from just the experience and feeling, this is what actually happens when you ingest marijuana: the chemical compounds of cannabis (the cannabinoids) communicate with the body’s endocannabinoid system. These receptors are located in body and brain and certain functions are stimulated and/or effected. Essential functions such as pain and inflammation regulation, appetite, emotions and focus are all involved (depending on the cannabinoids of the particular bud). There are two main cannabinoids that our endocannabinoid system reacts to, one is non-psychoactive (CBD) and the other is psychoactive (THC). CBD promotes an overall sense of relaxation and bodily well being while THC stimulates mental functions like focus, clarity and also stimulates energy. Some research has shown that our bodies and minds naturally produce such sensations and compounds after exercise. In particular is a natural compound that our body’s produce called anandamide. Cannabis, once ingested into the body, stimulates this natural process. Studies and research into this phenomenon and the effect that weed has on our bodies and minds, particularly during, before or after exercise is extremely limited. Additionally the studies that have been done have been focused on determining the negative effects of CBD and THC. Cannabis can also be used to have a calming effect while still placing the mental focus in a state of high clarity and determination. All these positive effects are merely circumstantial and based on individual experiences, however as the legalisation of cannabis spreads more studies are surely bound to come. For now, use common sense if you are interested in trying cannabis during your athletic activities and avoid inhalation as a delivery method as that delivery method, no matter what it is that is being inhaled, is potentially detrimental to health. Cannabis is still illegal under federal law although the state of California is among a few states that have voted on the legalisation of the plant. Among the many positive reports that stream in from cannabis users there are also a fair share of somewhat negative associations as well. Cannabis can also cause the heart rate to rise significantly and this could be inhibiting for some athletes. If the cannabis being used has a very high THC level with little to none CBD than anxiety and nervousness can ensue, a sure recipe for disaster before a big athletic event. In short; know what cannabis you are ingesting and anything (especially self medicating with cannabis) done in ignorance can lead to the adverse effects than the results you were seeking in the first place. Legally speaking, medical marijuana is legal in twenty five states (so far) and recreational marijuana is legal in only four states. And since we are on the topic of athletes using marijuana, it should be mentioned that cannabis is currently still banned by the World Doping Agency. However, if you are not an elite athlete and are curious about trying cannabis to enhance your athletic experience then be sure to find a reliable and cannabis dispensary that has an ethical growing method and can provide detailed information on the strains and types of marijuana you need.